Starting January 6th, celebrate Hallmark Channel’s Winterfest by entering the Hallmark Channel Winterfest Sweepstakes 2018. 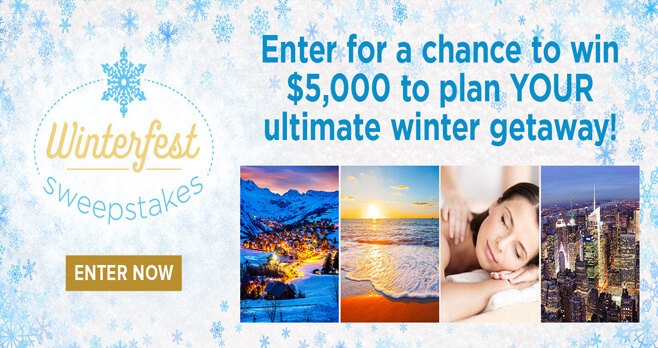 Visit hallmarkchannel.com/winterfest/sweepstakes and you could win $5,000 to plan a winter getaway. Who Can Enter? The Hallmark Channel Winterfest Sweepstakes 2018 is open to legal residents of the 50 United States, including the District of Columbia, age 18 or older at the time of entry. When To Enter? Sweepstakes begins at 9:00:00 AM PT on Monday, January 1, 2018 and ends at 8:59:59 PM PT on Wednesday, January 31, 2018. What Is The Winterfest Sweepstakes Prize? The Grand Prize consists of $5,000 which will be awarded in the form of a check payable to the winner. Who Are The Hallmark Channel Sweepstakes Winners? For a written confirmation of the winner (available after 02/05/18), send a stamped, self-addressed envelope (no later than 03/05/18) (postage not required for VT residents), to: Hallmark Channel Winterfest Sweepstakes, Winner Confirmation Request, PO Box 25466, Rochester, NY 14625-0466. I love hallmark movies and all things hallmark. I will miss seeing the variety of Christmas movies! Thanks for being here for your fans! this would be great to surprise our daughter in Rhode Island for Christmas. Our grandson is 2 & this would be soo amazing for all of us.